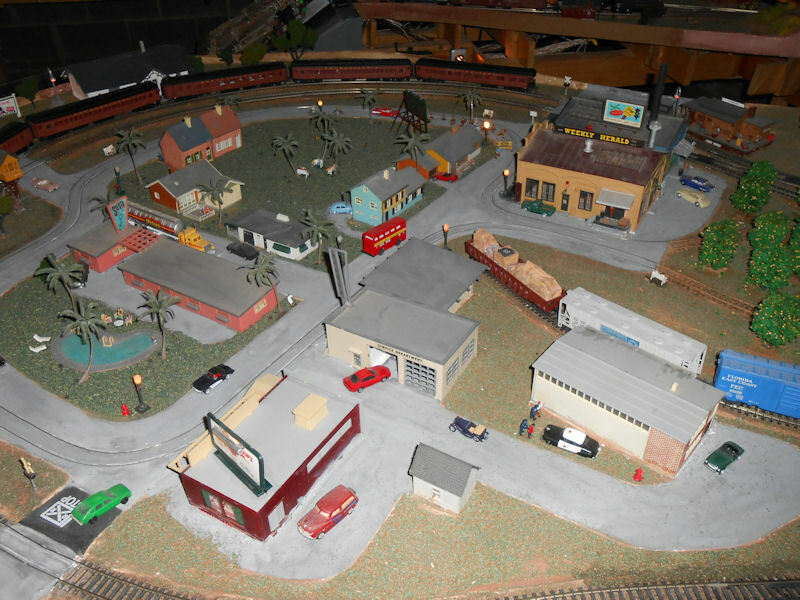 P&WRR webmaster Ken Humphreys originally started building his Florida, Pennsylvania and West Virginia Railroad HO layout in 1965 in Morgantown, WV. Upon moving to Granite Falls, NC in 1993, the original FP&WV was dismantled and was reincarnated with a much larger track plan. 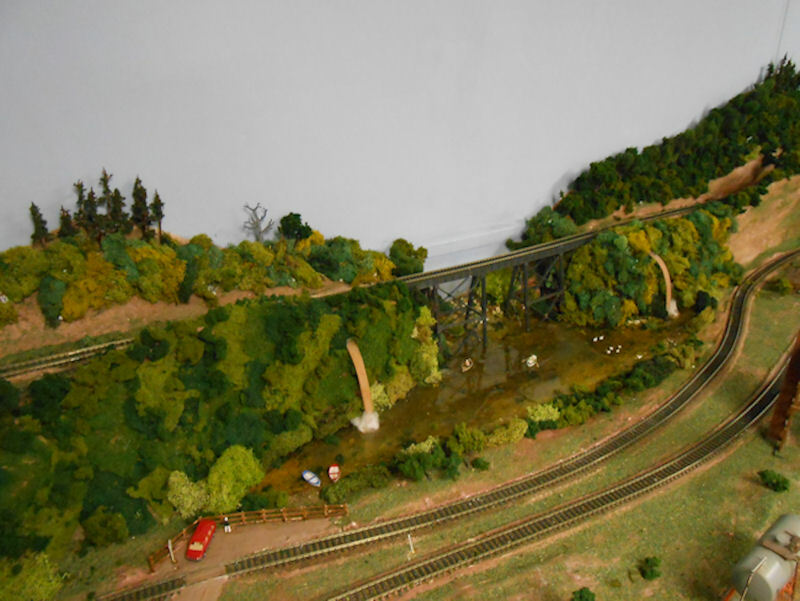 The layout models areas in the West Virginia coal fields, South Florida were Ken grew up, and in its resurected form has a section patterned after the Hudson-Lenoir, NC area near where Ken now lives. 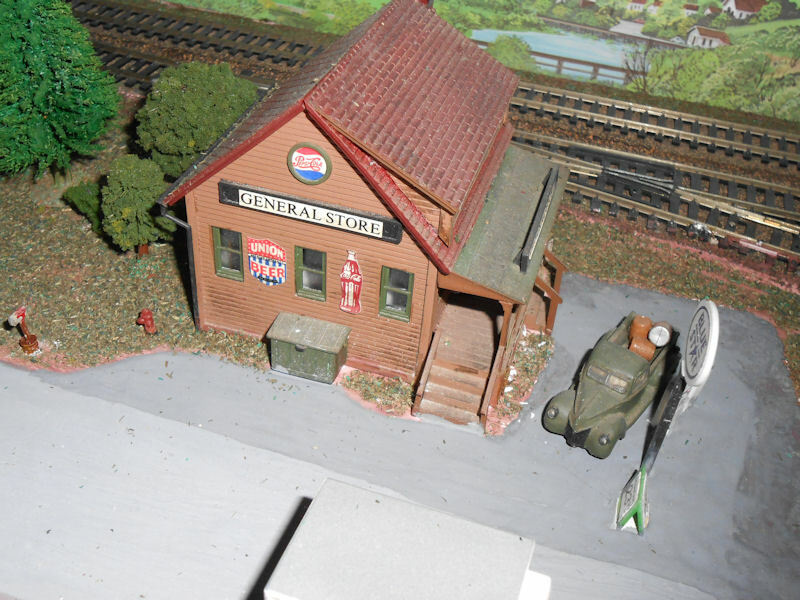 A trolley museum is also on the layout depicting the Arden Trolley Museum (now the Pennsylvania Railway Museum) in Washington, PA where Ken worked as a motorman for many years. The 230 square foot layout fills a 13' x 17.5' room in the basement of Ken's home. 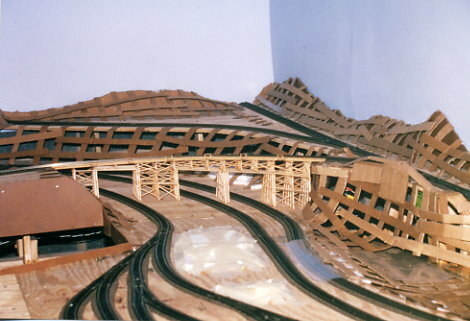 The layout is fully scenicked including signals and street and building lights. As is typical, the layout is a work in progress with further additions planned including skirting around the layout to hide the bench work and addition of more signals. On the walls of the room above the layout are displayed an array of railroad antiques. Click on the description with thumbnail image below to see the full size versions of the images. Benchwork under construction >in 1994. 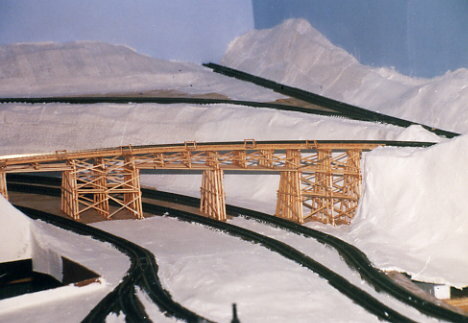 Note the scratch built curved trestle. Cardboard lattice applied to bench work in preparation for adding the hard shell, May 1995. 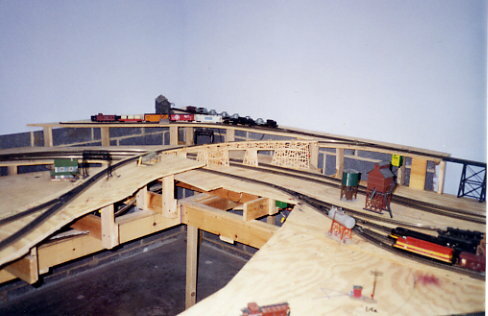 Scratch built trestle in April 2007 before scenery was added. The mountain top mine and "rocking horse" oil pump above the curved trestle. Engine house with a Shay-powered log train passing on an adjacent track. An ore train approaches the main line. Note the shack and moonshine still on the nearby hill. Loaded coal cars at the Humphrey Mine preparation plant. A tunnel through a pine covered mountain. A rural farm in the foreground. A rural West Virginia farm scene. A mountain lake with tracks passing over a bridge far above. Cattle out to pasture and horses in fenced paddocks. Scene near Lenoir, North Carolina. Note the scratch built model of a Broyhill Furniture factory and the electrified Rexall Drugs sign on the roof. The FP&WV RR freight yard. A Walthers bascule bridge across the entrance to the layout room. Note the approaching freight powered by a BL2 FEC locomotive. A country church and cemetary. FP&WV RR control panel and track map. 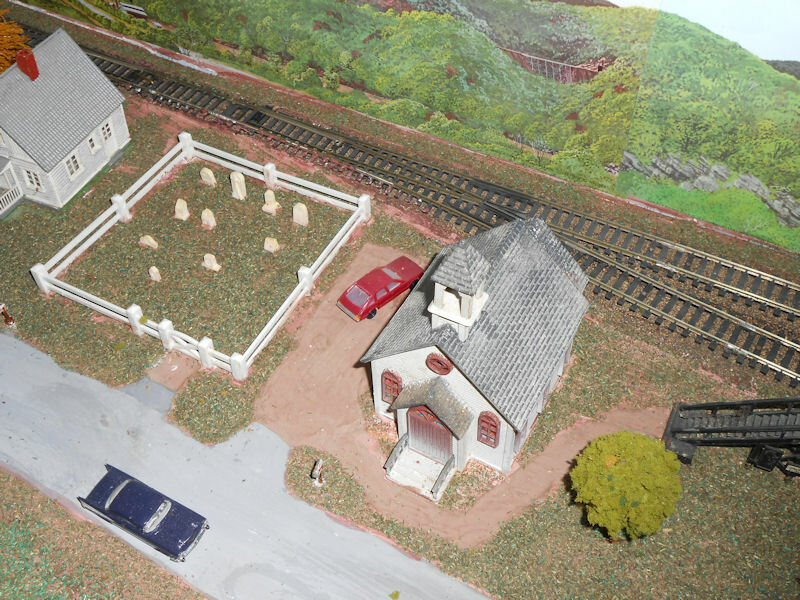 A B&O tail-end marker lamp, three antique Pressed Prism Glass coach windows and a model display above the layout. Pennsylvania Railroad and Nickel Plate Railroad Pressed Prism Glass coach windows and a display of other railroad antiques. More railroad antiques and a model display case.